This is really a quite critical point. Wallace and Rusk, while not discussing prophetic language, nonetheless addressed the differences between Hebraic thought and the modern Bible reader: “The Israelites did not hold to a 21st century Western view of life. They held a world view totally different from our modern one, which has been strongly shaped by science. We cannot understand their ideas about sacrifice through the filter of our modern world view. Their sacrificial ideas corresponded with the way in which they understood the world, so we can only understand their sacrifices properly within their cultural context.” (Wallace and Rusk– Moral Transformation, (New Zealand, Bridgehead Publishing, 2011)200). Ralph Wilson put it this way: “The Bible is a Hebrew book, telling the story of the Hebrew people. Jesus was a Hebrew Lord. We, on the other hand, are Western people sharing a very diverse and sometimes controversial heritage that comes from many sources’ He concludes incisively: ‘If the Bible is going to be understood in our day, we must develop ‘Hebrew eyes’ and Hebrew attitudes’ toward life.’ Western eyes’ must be replaced by Eastern eyes’ if modern Christians intend to read the Bible in the way it was written. The Bible can make sense only when it is viewed and studied in the light of its own distinctive Near Eastern setting and cultural context. Such a challenge to today’s church has been issued now where more emphatically than in the words of the late Swiss Protestant theologian, Karl Barth: ‘The Bible…is a Jewish book. It cannot be read and understood and expounded unless we are prepared to become Jews with the Jews.” (Ralph Wilson, Our Father Abraham, (Grand Rapids, Eerdmans, 1989)24). What all of this means– and this kind of quote could be multiplied many, many times over, is that it is misguided for modern Bible students to read the Bible through the lens of modern man. We define the world differently. We look at nature differently. Our literature is different. So, when Robert Kramer goes to Revelation 1:7 which reads that “every eye shall see him” and extrapolates from that a prediction that Christ will one day come out of the sky and be seen by every human being on the entire globe, he is ignoring the way the ancient Bible writers expressed things. Furthermore, he is even denying the immediate controlling context. First of all, Revelation 1:1-3 says “these things must shortly come to pass.’ There is no way to ignore that language without doing violence to it, and yet this is precisely what the critics almost invariably do. Shortly does not mean “Well, when it happens it will happen with rapidity.” That is not the meaning of the language, and it is an abuse and distortion of the words to try to make it mean rapidly as opposed to imminently. See my book, Who Is This Babylon? for a thorough examination of that language. For an in-depth study of the objective meaning of the time statements of Revelation, get this book! Nothing else like it anywhere! Second, the context of the coming is clearly delineated right there in the text. The coming in view (pun intended) would be his coming on “those who pierced him!” The text is emphatic and undeniable. And notice how this relates to the rest of the NT narrative. When Jesus was on trial he told the Sanhedrin that they would see him coming on the clouds of heaven with power and great glory. They understood that he was referencing Daniel 7 and that prophecy of the coming of the one like the Son of Man– in judgment and vindication of the martyrs– which would include himself (Daniel 7:21f). What we see in Revelation is the playing out of that blood guilt. After all, Revelation 11:8 depicts the impending judgment of the city “Where the Lord was slain.” Here is the answer of the cry in Matthew 27:25! Revelation predicted the fall of the city guilty of the blood, not only of Jesus, but of the prophets (Revelation 16:6), and of the apostles and prophets of Jesus. No other city in history was guilty of such a internecine history! For the critics to ignore the entire narrative of scripture as to the guilt of Israel in killing the prophets and saints is to totally miss the point in Revelation. The book begins with the story of persecution and martyrdom, and the promise of vindication runs through to the end of the millennium! Revelation is not about the judgment of Rome per se. It is not about the fall and judgment of the Roman Catholic Church– After all, the RCC never did what Revelation describes “Babylon” as doing! (See my Babylon book for more on this). 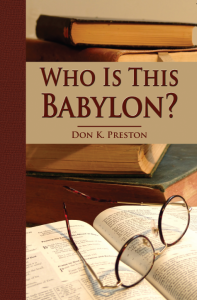 Literal Babylon in Iraq did not do what Revelation describes. Only one city matches the horrific history described in the Apocalypse, and that city was Old Covenant Jerusalem. She and her guilty leaders would see Christ coming in their judgment, vindicated as Lord, when the city fell. In that act, orchestrated by Christ as King of kings and Lord of lords, they would see him coming on the clouds of heaven. It is simply wrong to impose on that language the idea of an end of time, end of human history, cosmos destroying event. And so, Robert Kramer’s objections to Covenant Eschatology are wrong. He and the other critics are wrong to overlook these issues. Previous Previous post: Responding to the Critics| A Response to Robert Kramer – #3– Will Jesus Come on the Clouds?